For once in my adult life, I got an idea for a Halloween costume BEFORE the day of a Halloween party. I got to spend a whole week prepping my costume, which was good, because it involved ordering several items from Amazon and sewing a dress. 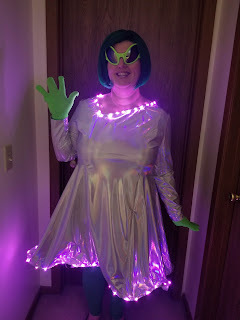 And I got an idea for a matching theme for the trunk or treat (which was moved inside, but we got a couple days advance notice and I was able to adapt my plans) which I was able to execute mostly the way I wanted to. 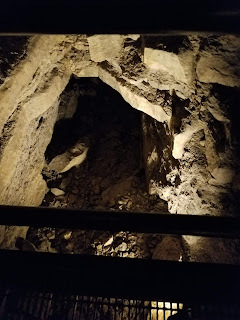 I thought Minnesota was essentially a caveless state, other than a few holes in the limestone in St. Paul and a manmade one (Wabasha Cave--also in St. Paul), but when Jim and I started on this State Parks kick, we learned that there is a cave system in MN, south of Rochester. We had to go, and picked the last weekend it was opened to hit it up. Forestville/Mystery Cave state park. Two thumbs up, would recommend. The Mystery title comes from the mystery of why there are no lakes in that area and it has to do with the cave. The tour guide pointed out clues to the puzzle and pointed out basic geological cave formations. We learned about flowstone, dripstone, drapery, domes, pockets, floods, limestone, carbonic acid, fossils, mudstone, etc. Matt leaves today. 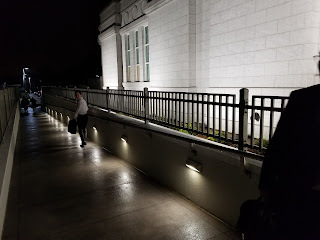 He's flying to Provo this evening to enter the MTC tomorrow. Is the Arkansas Little Rock mission ready for him? Is he ready for his mission? I don't know. But he's going. I don't know yet if I'll do a mission blog. I sort of forgot about that until recently.